Kawasaki ZN750A LTD (1984 - 1985). Bikemaster TruGel Battery. Contains: One TruGel Battery. The TruGel Battery by BikeMaster is a gel electrolyte powersports battery with a life span twice that of a wet battery. Bikemaster TruGel Battery. Contains: One TruGel Battery. The TruGel Battery by BikeMaster is a gel electrolyte powersports battery with a life span twice that of a wet battery. Kawasaki KZ750K LTD (1983 - 1984). Compatibility: 1983 Kawasaki KZ750-F LTD, Spectre. Power Source Batteries make up one of the most complete battery lines in the Powersports industry. 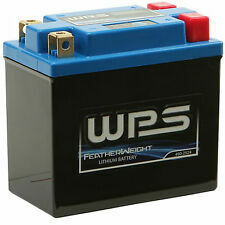 We have batteries to fit most Motorcycles, ATV and Personal Watercraft. Why is Gel better?. Gel electrolyte will not leak like acid or AGM Batteries. Gel Batteries require no venting and will not overflow. For more information check out the BikeMaster website. 1983 Kawasaki KZ750H LTD.
Bikemaster TruGel Battery. Contains: One TruGel Battery. Yuasa Equivalent: YB12A-A, 12N12A-4A1 (TruGel). The TruGel Battery by BikeMaster is a gel electrolyte powersports battery with a life span twice that of a wet battery. Bikemaster Conventional Battery. Kawasaki KZ750H LTD (1980 - 1983). Bikemaster's Basic 6V and 12V dry battery, best used for older applications. Contains: One Dry Conventional Battery. Honda CB400T Hawk (1980 - 1981). Misc Body Parts Mirrors. Eyewear Clothing & Accessories. Engine Related Parts. Electrical and Lighting. Classic Picks. WEIGHT2.0 lb. HEIGHT5.20 in. WIDTH3 in. KZ700A Sport 1984. KZ750R GPz750 1982. KZ750E Sport 1980-1982. KZ750L Sport 1983. KZ650H CSR 1981-1983. KZ750H LTD 1980-1984. AGM BATTERY. AGM (absorbed glass mat) is a special design glass mat designed. YTX14AHL-BS Sealed Lead-Acid AGM Motorcycle Battery. 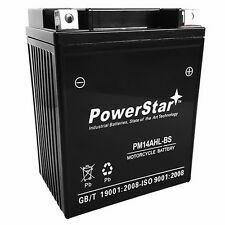 PowerStar YTX14AHL-BS SLA Battery. • Maintenance Free Battery. •Spill Proof ( Sealed Lead-Acid ) Battery. PowerStar Battery General Features Sealed Construction. 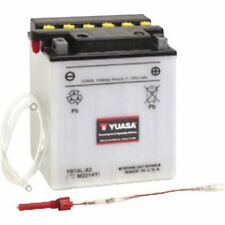 Battery Type Number: YT12C SMF (Sealed Maintenance Free). 1x Battery (YT12C). Battery Family: AGM Maintenance Free. The KMG Battery is maintenance-free, resists shock and vibration, and never needs re-filling. YB12A-A High Performance Conventional batteries by Chrome Battery are built to deliver high cranking power for easier starting. It features special thin separators that allow two extra plates per cell to be installed for a 30% improvement in cranking performance. All YB12A-A Chrome Battery brand High Performance Conventional batteries are manufactured with the highest quality materials and rigorously tested to ensure safety, OEM compatibility, effectiveness and optimal performance. Extremely Fast & Free Shipping. 60-day no questions asked money-back guarantee. 18-month warranty. .
Why is Gel better?. Gel electrolyte will not leak like acid or AGM Batteries. Gel Batteries require no venting and will not overflow. For more information check out the BikeMaster website. 1983 Kawasaki KZ750F LTD Shaft. JIS 12N12-4A, 12N12A-4A-1, YB12A-A, YB12AAS, YB12A-A-WS, YB12A-B, YB12AL-A, YB12AL-A2, YB12C-A. Motobatt Features Conventional / JIS MOTOBATT Capacity AH L (mm) W (mm) H (mm) Notes. Honda CB360, G, T 360 74-76. The KMG Battery is maintenance-free, resists shock and vibration, and never needs re-filling. High Performance Battery. Battery Type Number: YTX14AHL-BS SMF (Sealed Maintenance Free). Battery Family: AGM Maintenance Free. New Bikemaster Trugel Battery Bm Mg12a 4A1 Manufacturer Part Number: MG12A-4A1 (Trugel Battery) Item only fits specific models listed. The picture could be generic. Message us with VIN/HULL for fast fitment verification. Color: Blu | Size: N/A Fits: Please note that we currently cannot display fitment from the Manufacturer at this time. If you would like for us to quickly verify and guarantee fitment for your vehicle, please contact us with the VIN for your vehicle. .
YuMicron / Conventional. Sulfate stop to reduce battery sulfation. Helpful Links. Full product line. Kawasaki ZN750A LTD (1984 - 1985). Bikemaster Conventional Battery. Bikemaster's Basic 6V and 12V dry battery, best used for older applications. Contains: One Dry Conventional Battery. Kawasaki KL600B KLR 600 (1985 - 1986). Battery Type Number: YTX14AHL-BS SMF (Sealed Maintenance Free). Battery Family: AGM Maintenance Free. High Performance Battery. The KMG Battery is maintenance-free, resists shock and vibration, and never needs re-filling. Kawasaki KZ750K LTD (1983 - 1984) With sensor. Bikemaster Conventional Battery. Bikemaster's Basic 6V and 12V dry battery, best used for older applications. Contains: One Dry Conventional Battery. Kawasaki KZ750 GPz (1983 - 1985) With sensor. Type : Battery. CONVENTIONAL 6V AND 12V "Ready to Ride" BATTERY KITS. We understand that such delays can be very inconvenient when they occur, but we do not have any influence over such situations. (unless otherwise noted). Computers can do a lot of neat things but we can not always get them to do what we want. We are here to help! 1981 Yamaha XS850L Mid-Special. 1980 Yamaha XS850. 1981 Yamaha XS850. 1978 Yamaha XS750S. New Shorai Inc Lithium Batt 14Ah 12V Eq "L"5 Manufacturer Part Number: LFX14L5-BS12 (Lithium Battery) Item only fits specific models listed. The picture could be generic. Message us with VIN/HULL for fast fitment verification. Color: Red | Size: N/A Fits: Please note that we currently cannot display fitment from the Manufacturer at this time. If you would like for us to quickly verify and guarantee fitment for your vehicle, please contact us with the VIN for your vehicle. . Battery Type: YuMicron. Model: KZ750, LTD, CSR. It has never been used in any way. attery acid is NOT included. The industry standard for motorcycles and riding mowers, our Yuasa Conventional Battery is anything but conventional. CONVENTIONAL 6V AND 12V "Ready to Ride" BATTERY KITS. 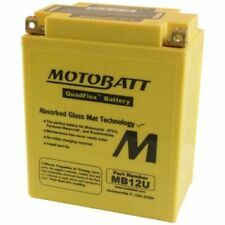 SEALED MAINTENANCE FREE 12V BATTERY. 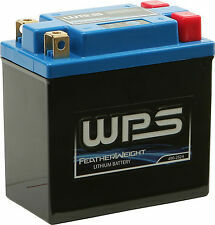 A must for motorcycles and ATVs that require a sealed battery. 1/2 the price of an OEM sealed battery. Easiest battery for dealer.